Indigenous to Sarawak in Malaysian Borneo, empurau is the most expensive edible freshwater fish in Malaysia. Its reputation for taste and texture reach all the way around the world. The empurau's difficult-to-find reputation and slow growth rate make it even more sought after, adding to the price of this pricey delicacy. Although much of the Western world doesn’t consider carp a delicacy, large empurau are prized for their rich, delicate flesh and firm texture. Empurau get their unique taste from a diet of special local fruit that falls from trees into the rivers. The taste of empurau is often described as creamy, savory, a little sweet, with hints of wild fruit. And while Dayak fishermen in the jungles of Borneo once caught empurau frequently, they did so only to put food on the table. Today, empurau are fished solely for profit. Local fishermen who know better wouldn't dream of eating something that represents several months' worth of salary! Empurau, and other valued fish native to Sarawak, are threatened by unregulated fishing. Catching a mature, five-kilogram empurau is akin to hitting the fishing lottery. A single prepared fish in a restaurant can cost between US $300 – $500! Empurau are members of the tor tambroides species found throughout Southeast Asia, also known as kelah or belian in the Malay language. The species can be found in Thailand's Chao Phraya and the Mekong River in several countries. What makes the empurau in Borneo special — and more valuable — is its diet. Empurau are freshwater, bottom-feeding scavengers. They are omnivores, meaning they'll pretty well consume whatever comes along. A few special ones sustain themselves with a diet of wild fruit that falls from trees overhanging the jungle rivers in Sarawak. According to fans, the fish's frutarian diet is what gives the flesh a sweet, delicate flavor that is completely unique. 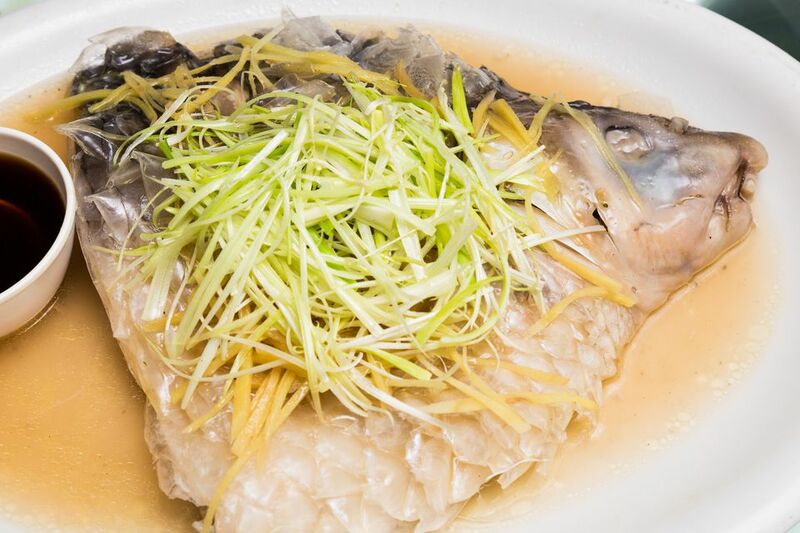 Empurau are considered so rare and tasty that they are referred to as "The Unforgettable" (wang bu liao) in Chinese. It is also referred to as the "King of the River." But they aren't always eaten. Fish in the tor tambroides species have a shiny, attractive appearance and reputations as fierce fighters. They have become sought after as ornamental fish, symbols of good fortune. Throughout Asia, many species of carp are prized as auspicious symbols of good fortune, sometimes fetching surprisingly high prices. Local superstitions claim that the loyal empurau will sometimes die in its owner's stead, protecting the owner from disease. Ikan (pronounced "ee-kan") means "fish" in Bahasa Malay, so empurau are referred to locally as ikan empurau. How Much Does Empurau Cost? A single one-kilogram (2.2-pound) empurau prepared in a restaurant can cost between US $300 – 500. Price varies widely depending upon the age andweight of the fish. When a high-roller flies in (often from China or Singapore) with people to impress, cost is no object. Prices can exceed US $500 per kilogram. A one-kilogram empurau was purportedly sold in Ipoh, Malaysia, for US $400. The same customer claimed that they had paid US $560 for a one-kilogram fish earlier in Kuala Lumpur! The river, and even the stretch of that particular river, in which an empurau is caught makes a difference. Shorter empurau with white flesh are typically valued more than their red or copper-colored counterparts. Firmer flesh from fish over three kilograms in weight is preferred. Fish caught near Kapit also fetch a higher price. In March 2016, the Borneo Post reported that a giant, 7.9-kilogram (17.4 pounds) empurau was sold by a fishmonger for the equivalent of US $1,940 in Malaysian ringgit! Why Is Empurau So Expensive? For starters, they are difficult to find. Wild empurau are indigenous to Sarawak, Borneo, and are only found in the wild rivers. Only a few stretches of those rivers are home to the right fruit trees along the banks. Empurau grow slowly. Generally, a fish needs to survive in the wild at least three years before it is considered marketable. As empurau become more successfully farmed, prices drop a little. But wild-caught empuraru will probably always be preferred by the high-end market the fish serves. The International Union for Conservation of Nature doesn't have much data on the empurau's wellbeing yet. But given the current price and reputation, the slow-growing fish is generally considered to be under threat. Like other species in Borneo, the empurau faces severe habitat loss. Excessive logging, primarily to make way for palm oil plantations, is a widespread problem in Malaysian Borneo. But there is some good news. As empurau farming techniques improve, the delicacy is being touted by organizations as a classy alternative to shark fin products often served to impress at weddings and banquets. Perhaps one day the bottom-feeding river dweller may help relieve some of the enormous pressure put on shark populations due to finning. The empurau have another thing in their favor: only larger empurau are considered valuable because smaller fish have a high-fat content that makes the flesh too soft. This gives the young fish slightly better odds of being allowed to mature. Attempts at farming and artificially raising empurau had little initial success. A collaborative aquaculture effort between Deakin University in Victoria, Australia, and the Sarawak government turned up some signs of hope for the species. The Royal Empurau group was formed in 2016 with a mission to create sustainable, farmed empurau to meet growing demand. Semi-wild empurau raised in ponds are slightly cheaper in restaurants than the wild-caught equivalent. The government hopes that one day empurau can become a significant, revenue-generating export for Sarawak. Empurau can also be found on menus in Penang and Kuala Lumpur. To ensure a good experience, contact the restaurant days in advance to make arrangements and confirm availability. Don't just turn up expecting empurau to be in stock! For a much more affordable seafood experience in Kuching that doesn't involve eating empurau, check out the famous Top Spot Food Court on Jalan Padungan.